Dr Stella Nyanzi addresses journalists recently. Kampala — The Lawyers for remanded former Makerere University Research Fellow, Dr Stella Nyanzi, have written to Uganda Human Rights Commission, seeking its intervention into her fate and order Luzira prison administration to allow her see a private doctor following a miscarriage she suffered in custody about a fortnight ago. Her lawyers of Centre for Legal Aid contend that Dr Nyanzi is in urgent need of a post-abortal care and management but the prison authorities have denied her access to her antenatal card and other medical records, which are currently being kept by the prison authorities. "We understand that our client suffered a miscarriage on January 4 and is in urgent need of post-abortal care and management. "We also understand that the prison authorities have rejected, ignored or inordinately failed to respond to our client's requests for access to antenatal card and other medical records kept by the Uganda Prisons Service and access to emergency private medical treatment at her own cost," the lawyers petitioned the Human Rights Commission on January 16. "In the premises, our client's personal doctor has until now been unable to evaluate the adequacy of treatment so far administered to his patient nor to determine the necessary health interventions for his patient at this critical juncture," the petition to UHRC further reads. 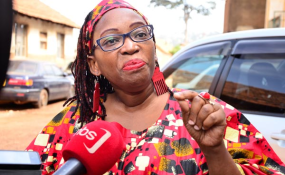 Dr Nyanzi's lawyers want UHRC to visit Luzira prison's Women Wing to assess the condition that their client is in and make recommendations, commence investigations into the violation of her right to health and access to emergency private treatment. The lawyers also want UHRC to order the Commissioner General of Prisons and his agents to allow Dr Nyanzi access her private doctor immediately. Dr Nyanzi has been on remand at Luzira prison since November last year on charges of cyber harassment and offensive communication. On January 9, she told the High Court that she had suffered a miscarriage while in prison.